At Pleasant Valley Conservancy, leading up to this growing season, we burned more acres this year than ever. This includes the burns of last fall as well as those of this spring, since both burn periods occurred "after" last year's growing season. Our success was despite the challenging weather. Why were we so successful? Advanced planning. Careful attention to weather predictions. Understanding how the weather forecasts work. Experience in how to set up burn units and fire breaks. Good personnel. Luck. 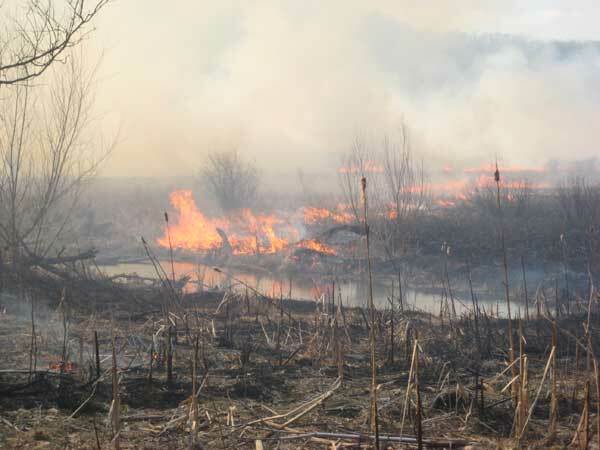 On Wednesday April 24 the major wetland burn that we had planned for this year was accomplished. Wetlands are not common in the Driftless Area, but there is a fairly large one attached to Pleasant Valley Conservancy. This five-owner site of 132 acres is in the East Blue Mounds Creek drainage and receives water from Elvers Creek, Ryan Creek, and Pleasant Valley Creek, all of which are cold-water streams. (Elvers Creek is a well-known trout stream.) There are also numerous springs rising within the site. 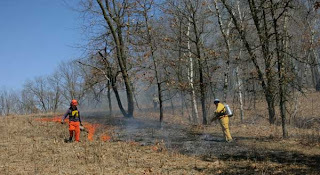 In 2005, at our urging, a program to rejuvenate this wetland by occasional prescribed burns was initiated by the U.S. Fish & Wildlife Service. However, after the 2010 burn, F & WS pulled out of the program. 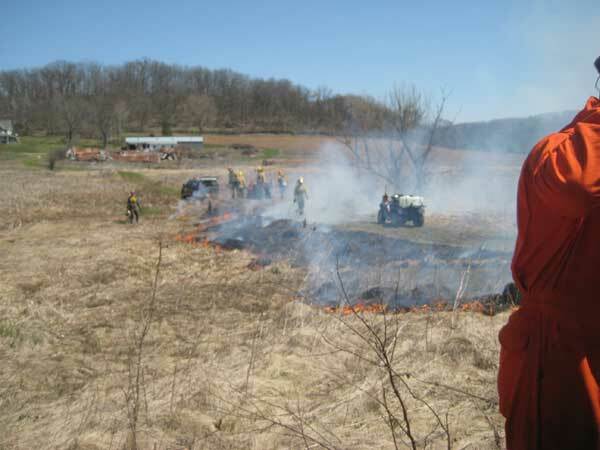 Realizing the need for continued burns, the Savanna Oak Foundation took over financial support. 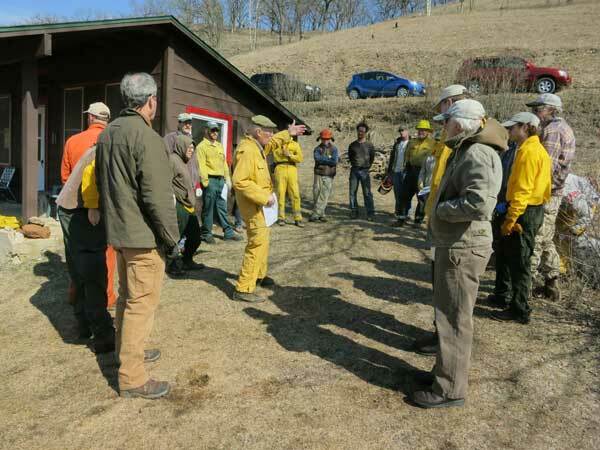 Those participating in this year’s burn were Tom Wise (burn boss), Dan Wallace (assistant burn boss), Jim Elleson and crew (Quercus Land Stewardship Services), and the crew of Michler/Brown LLC. Also participating was Amanda Budyak from Pleasant Valley Conservancy. 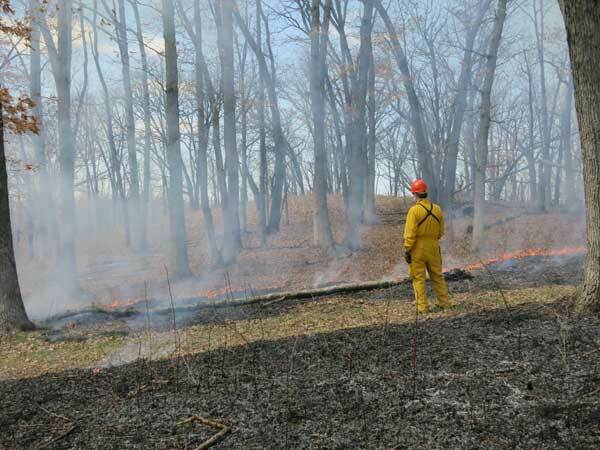 With this spring’s challenging weather, and the need for a large experienced crew, finding a suitable day for such a complicated burn was a problem. 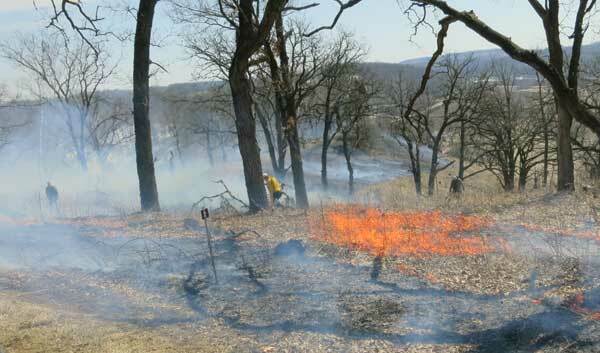 Fortunately, there was a brief window of suitable weather on Wednesday April 24, 2013 and the burn was done. The burn unit is shown on the attached map. The burn unit involves five property owners. It is bounded by Dane County Highway F and Pleasant Valley Road. After the burn. View up the valley from the lookout atop Pleasant Valley Conservancy. Only areas with open water did not burn. 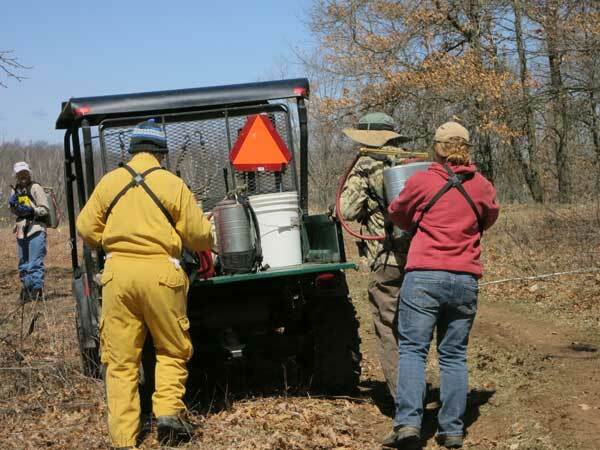 Visitors have an unequaled opportunity to see the results of this burn. 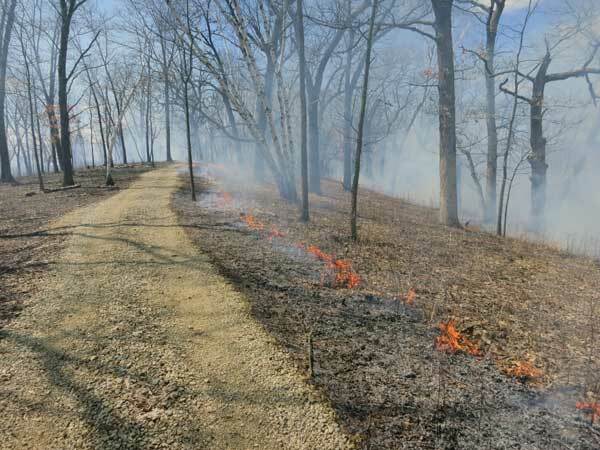 The trail along the Crane Prairie is right next to the burn unit and connects with the boardwalk that leads to the Pleasant Valley Creek trail (visible as the unburned strip along the creek in the photo above). This trail forms a loop that leads back to the main trail near the Valley Prairie. Sandhill cranes and Canada geese are frequent visitors, but there is other wildlife, including many wetland species. Our urge to burn must have been infectious. 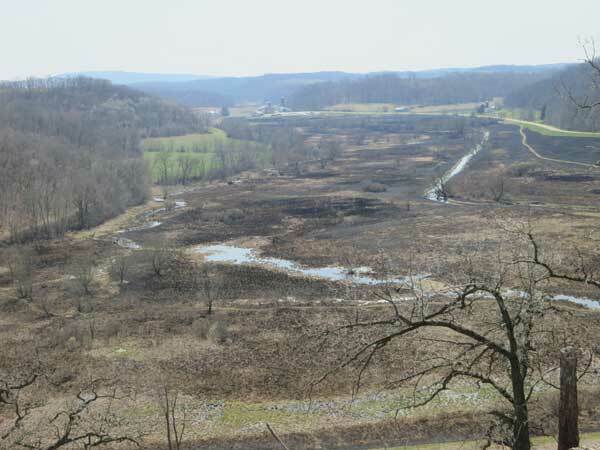 The following weekend much of the wetland upstream from our site was burned by other landowners and neighbors! Yesterday afternoon we burned 31 acres of savannas and oak woodlands, thus finishing our upland burns for this season. Fire line just starting to move into a white oak woods. The burn will be speeded up by interior lighting. Note how brush-free this woods is. 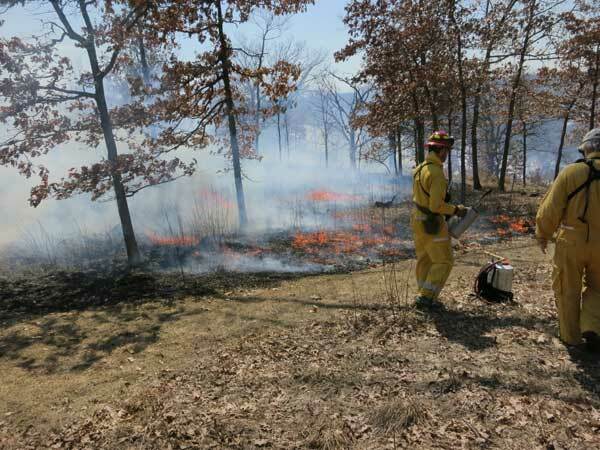 Oak savanna and woodland burns are challenging. Oak leaves, the principle fuel, burn at lower temperatures, with lower flame heights and slower rates of fire spread. This makes for safer burns, since you can usually walk up to and step over the flaming front. 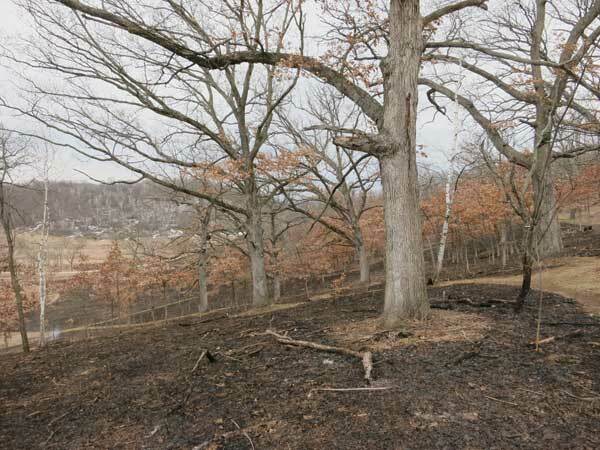 However, burn coverage is often spotty, since fallen logs often block the movement of the burn front. This is why a good, steady, but fairly stiff wind is desirable. However, if the wind is too strong, flame heights can get out of hand, and standing dead trees get ignited. Flaming fronts of an oak woodland burn. The two lines joined in about 15 minutes. The unit on the left has already burned. Yesterday, the weather conditions were ideal for the burns we were doing. There was a steady west wind, the humidity was low but not too low, and the strong sunlight had dried out the fuel. When we first ignited at noon, we were unsure how the woods would burn, but we soon realized we had ideal conditions. Although we had intended to burn only about 10 acres, we ended up burning 31 acres. The woodland here is mostly in a north-facing gully. Two weeks ago there was still lots of snow here. 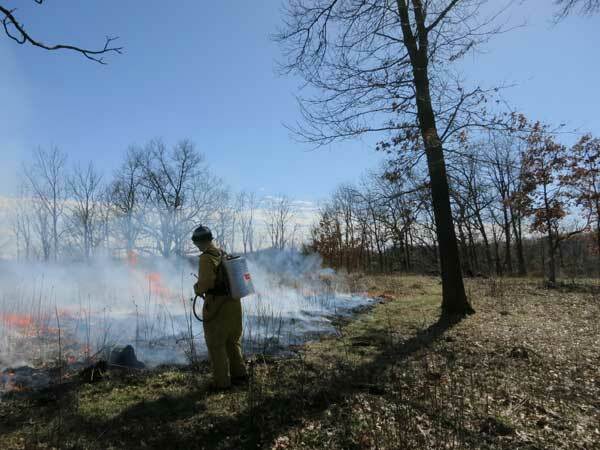 This spring we burned a total of 80 acres, which includes prairie remnants, planted prairies, savannas, and oak woodland. Considering the challenging weather, we are delighted that we have been able to accomplish so much. We owe this success to excellent burn crews, including a number of dedicated volunteers. Our friendly NOAA weather site promised us a single sunny day stuck in between lots of rainy days, so we burned. Although we still have lots of savanna areas (and a wetland!) 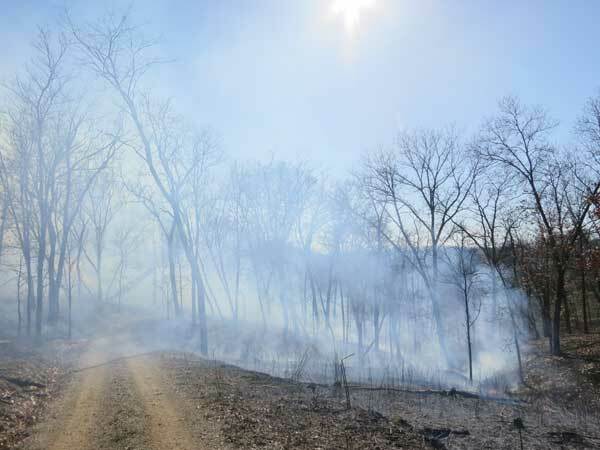 to burn, their fuel moisture would not drop as fast as those of the planted prairies. So yesterday we burned Toby, Ridge, the East Basin, and the part of the Pocket that was too snowy when we burned the rest of it on April 4. The day dawned cold but sunny. A check of the humidity showed fairly high readings but with a promise of lower values later in the day. (My Kestrel is broken so I am using a sling psychrometer to measure R.H.) We scheduled the first burn for 1 PM and spent the morning doing other work. We had an experienced crew of 6, which was large enough for these small (all less than 5 acres) prairies. Since all of the planted prairies are fairly small, they have lots of edges, which makes them complicated. You have to burn slowly. Toby was first planted in 1998 and is a nice prairie. When we started it was completely surrounded with an aspen clone that was gradually closing in. The aspen trees were girdled in 1998 and removed two years later. The aspen understory had remnant prairie and was enhanced by overseeding. It is now part of the prairie and it is difficult to tell where the original cropped area stopped. The principle fuel is Indian grass and little bluestem, with a high diversity of forbs. Burning the SE corner of Toby. Kathie is making sure the fire doesn't creep into the Triangle savanna. Once the edges are burned in, the main burn can proceed quickly, as the photo below shows.. Lighting the west end of Toby. By this time, the periphery was completely black so the center was burned rapidly. We started lighting about 1 PM and finished in an hour. The photo below shows the end result. The end of the Toby burn. This is slightly less than 4 acres. Because of last year's drought and the winter's heavy snow, the fuel was very sparse. However, we had a good wind, which helped carry the fire. The Ridge Prairie is less than 2 acres, but had been cropped and so was eligible for CRP back in 1987 when we first started in this program. However, it was not planted to prairie until 2005 and will be in its 8th growing season this year. It is sandwiched between an oak woods on the west and the East Basin prairie on the east. Now that the East Basin Prairie has become established, we burn these two prairies together. Kathie monitoring the west line of the Ridge Prairie. Since the East Basin (not part of the CRP) is now only in its 3rd growing season, the flammable fuel is still fairly spotty. However, it has quite steep topography which means that the fire moving uphill is essentially a head fire even if the wind is light. Some areas have fairly substantial Indian grass whereas other areas are principally less flammable forbs. The end result was that burn coverage was about 50-60%. Burning the SE corner of the Pocket Prairie. 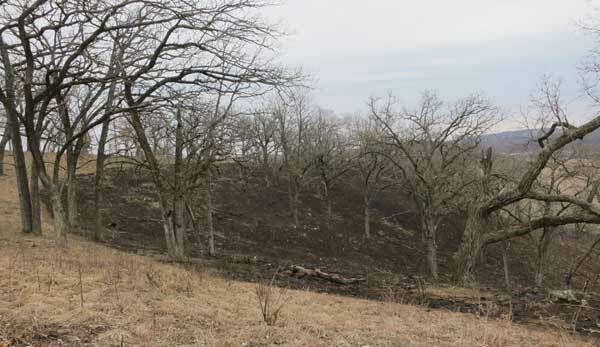 The rest of this prairie, now greening up, was burned on April 4. The striking difference between the early spring weather in 2012 and 2013 is noteworthy. This year's long, cold spring is not unheard of. If anything, it was the very early spring last year that was unusual. I have been keeping phenological data since 2002 and looked over the numbers. Because plants are great integrators of climate, I compared first blooming dates for three early-season bloomers: early buttercup (Ranunculus fascicularis), violet wood sorrel (Oxalis violacea), and golden Alexanders (Zizia aureus). If you look at these numbers, you can see that there has been quite a lot of variation from year to year, and that 2005 was also an early year. The early buttercup is the first plant that flowers in our area, and in 2009 it did not flower until 4/22, which is a week from now. Time will tell! After a very cold March and major snow drifts, things finally warmed up a bit and we were able to do some major burns. The weather was cold but clear all week, but on Thursday it promised to be warmer, with 35% R.H. and 10-15 mph winds. Although the wind gave us trouble with spot fires, it also helped carry the fire. Because we had a large crew (20 people), we did two separate burns at the same time: 1. The south-slope burn; 2. The basin savanna burn. The map here shows what we burned. The burns of 4 April. (The colors have no meaning.) The south-slope burn is Units 1-7. The basin savanna burn is the rest. The East Overlook was the dividing line. 1. South slope. Last summer's drought had a major effect on the grass growth on the south-facing slope. Instead of knee-high, little bluestem was ankle-high. We had never seen the prairie sod so impoverished. We still used the strip headfire technique, but instead of using four or five strips, we only used two. As usual, this burn began with creating a wide blackline at the top of the hill. This involved two drip torches plus lots of water because of spot fires elicited by the strong wind. This was the most time-consuming part of the whole burn. 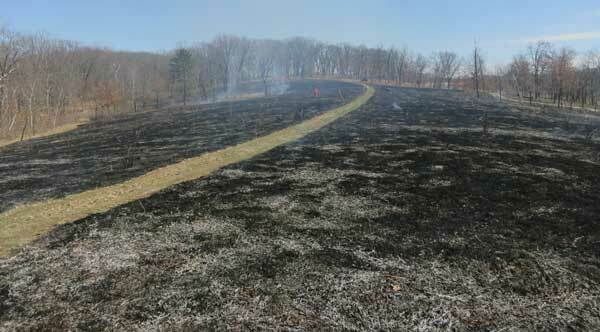 Once the blackline was in, a drip torch ran a strip across the middle of the slope. Once that was in, the final drip torch lighted from the bottom of the slope, at Pleasant Valley Road. Burning in the blackline at the top of the south-facing slope. The widening line can be seen in the distance. 2. Basin savanna. The basin had lost its snow about a week ago and although the grasses and forbs had also been affected by the drought, the oak leaves had not, and these were a major part of the fuel. We started lighting Unit 12A at the far NE end of the savanna. One drip torch went parallel to the top and the other went down the hill (above the ravine). 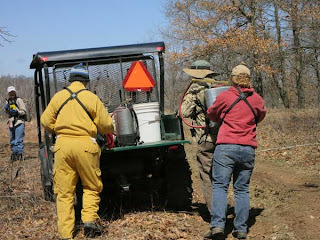 The burn boss coordinated the two drip torches, making sure that the upper one was well ahead of the one near the ravine. Once the 12A blackline at the top was burned in, the second drip torch lighted from below. This procedure continued through Unit 11D and 18, until the East Overlook was reached. After the whole savanna was on fire, the Pocket Prairie was burned, mainly as a headfire. We started lighting at 11:45 AM and finished at 2:45 PM. Because of the wind, we had the potential for lots of spot fires, so moved fairly slowly. All of the personnel were experienced burners. We had enough radios so that each person could have one. Each burn was run on a separate channel. Kathie, who operated the water supply from our Kawaski Mule, had two radios, one on each channel. 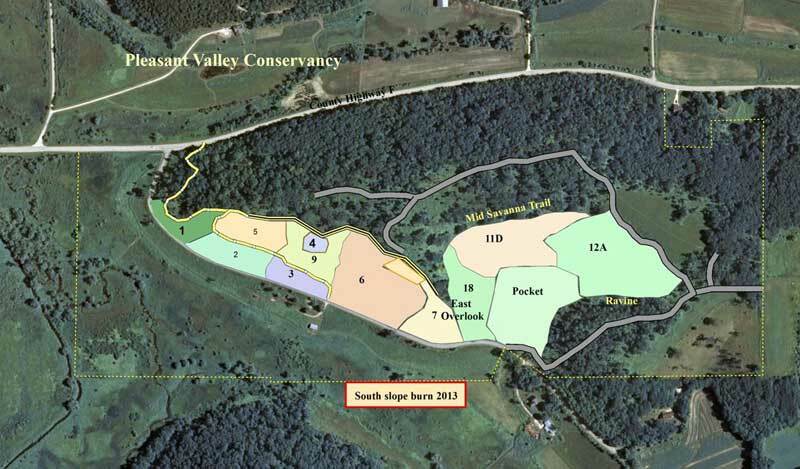 After a short lunch, we burned all of the planted prairies south of (below) Pleasant Valley Road: Valley, Barn, and Cabin. 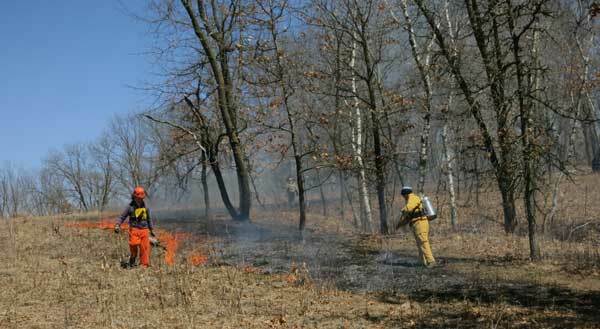 Then most of the crew moved to Black Earth Rettenmund Prairie to carry out an early-evening burn. Since the wind was still holding, this burn moved very fast (30 minutes for the whole burn). Two days later Kathie and I surveyed the burn areas and made notes on burn coverage. Much of the area had virtually 100% coverage, although there were a fair number of unburned areas on the uphill part of Unit 11D. probably because of patchy fuel. Upper part of the south-slope, with good burn coverage. 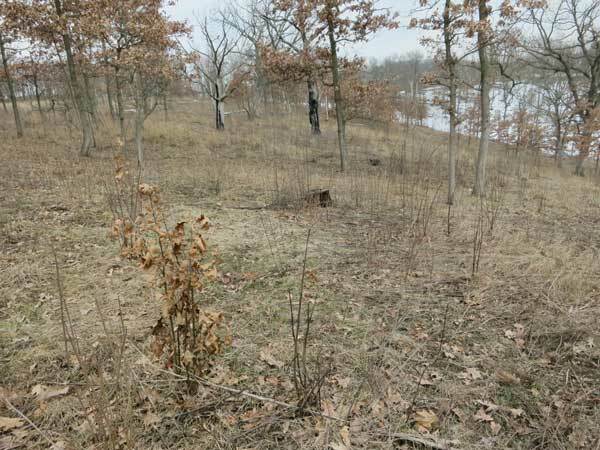 This is primarily bur oak savanna. The basin savanna burn. Unit 12A in front and 11D behind. Pocket Prairie at the bottom. The trees are white oaks. Most of the literature on oak regeneration deals with silvicultural matters, such as production of oaks for harvest. Oak regeneration must also be considered in savanna restoration, because the large, open-grown oaks that we encourage will eventually die and some replacement is needed. 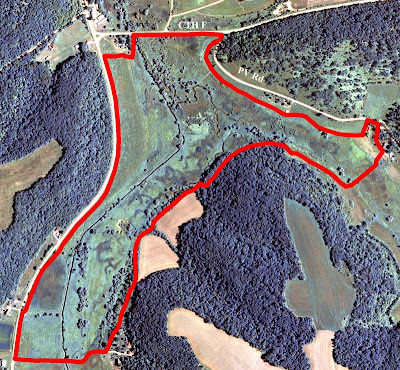 The discussion here deals with what we call the White Oak Savanna (Unit 12A) a seven-acre site which has a large number of handsome open-grown oaks. This was the first savanna area we restored, in the year 2002. We based the work on the 1937 air photo, a portion of which is shown here. The large, open-grown oaks are very evident. The 1938 Bordner land use survey classified the area between the two ag fields as "stump pasture." Most of the large oaks present in 1937 are still present, but (presumably) much bigger. 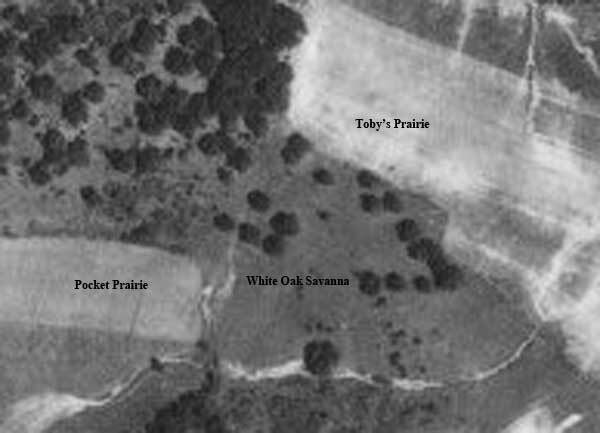 The White Oak Savanna in 1937. The two surrounding fields were cropped but are now prairies. 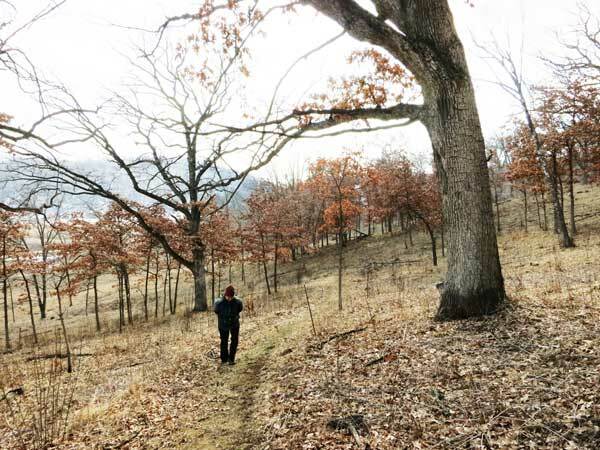 Kathie walking up the White Oak Savanna Trail. Two of the original large white oaks are visible. Most of the small trees with leaves are also white oaks. In addition to these areas of smaller white oaks, there are quite a few black oak grubs, such as the one shown in the photo below. The small plant with leaves is a black oak grub. There are dozens of such grubs scattered across the Savanna. Where have these black oak grubs come from? 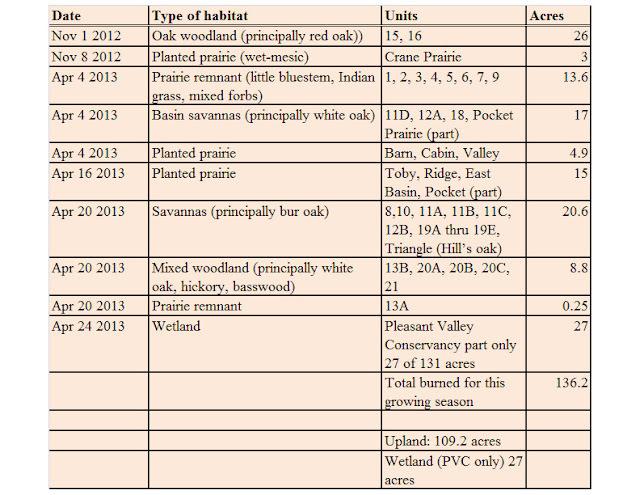 Recall that we cleared this savanna of black oaks in 2002 and it has been burned every year since then. Since there is no longer a black oak seed source, these grubs were probably here when our restoration work began. Each year they are killed back by the fire, and resprout again, a phenomenon typical of oak species. As long as we burn at regular intervals, we can keep them under control. Because of their presumed extensive root systems, I'm not sure if they could be eradicated with herbicide, with or without cutting.